Supporters of Rasmea Yousef Odeh, a Palestinian-American community leader in Chicago, have called on the US Department of Homeland Security to drop all charges, following her arrest on 22 October. Odeh allegedly lied on her immigration form to the United States 20 years ago. The Electronic Intifada reported that Odeh had failed to disclose her conviction by an Israeli military court in 1969 for alleged membership in the Popular Front for the Liberation of Palestine (PFLP) and two Jerusalem bombings. Odeh is expected back in a Detroit court next month, where she could face a sentence of up to ten years and have her US citizenship revoked. Friends and family were shocked by the arrest of a community icon and outspoken voice for Palestinian resistance and the empowerment of Arab women. Odeh has been the associate director of the Arab-American Action Network (AAAN) in Chicago since 2004. AAAN is a non-profit organisation that strives to strengthen the Arab community in the Chicago area, according to their website. "I panicked when she got arrested, namely, because she is 66 years old. Also, she is not a terrorist, but a fighter. She went to the US to become a social worker and help the Palestinian community," filmmaker and close friend Arab Lotfi told Ahram Online. "It is appalling that our government is now attempting to imprison her… We condemn this attack on our friend and colleague Rasmea, as well as the broader pattern of persecuting Arabs and Muslims who are outstanding and outspoken leaders in their communities in the US," AAAN said in a statement. Odeh was a victim of torture and sexual abuse in Israeli prisons, where she spent time as a political prisoner throughout the 1970s. She was given three life-sentences, but they were dropped when she was released as part of a prisoner release deal in 1979. "In her 20s, she was arrested and raped brutally in Israeli prisons, where she went through a traumatic experience," Lotfi said. "She represents the fight against sexual brutality in Israel, and is not supposed to be treated in this way," Lotfi adds. 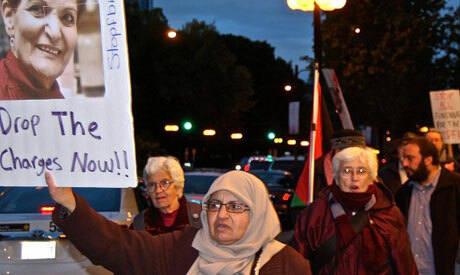 On 24 October, a demonstration in solidarity with Odeh took place outside the Chicago Hilton, where a fundraising event for the Israeli Defense Forces (IDF) was being held.